This Honey Garlic Crispy Chicken was honestly the bomb dot com. The chicken: tender on the inside, crispy on the outside. The sauce: Rich, sweet, and subtly salty and garlicky. The chicken and the sauce together: a match made in heaven! I used to think that Sweet and Sour is my favourite sauce to go with crispy chicken. But after making this recipe, I might have to reconsider things. So get yourself ready for some crispy goodness! This Honey Garlic Crispy Chicken was honestly the bomb dot com. The chicken: tender on the inside, crispy on the outside. Takes 35 min , serves 2. 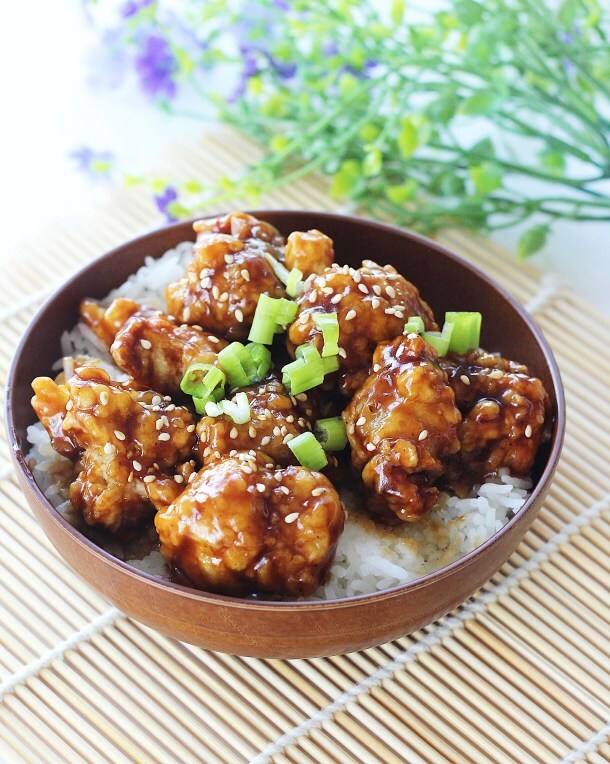 In a mixing bowl, combine the cubed chicken thighs, eggs, 2 tablespoons of cornstarch, and soy sauce. Mix well and set aside. To make the sauce, combine the soy sauce, water, honey, and brown sugar in a bowl and mix well. In a pan, heat the canola oil at medium high heat and cook ginger and garlic until fragrant and soft. Pour the soy sauce mixture and let cook by stirring occasionally. While the sauce is slowly cooking, mix cornstarch and water in a small bowl to make a slurry. Slowly add the cornstarch slurry into the pan while constantly stirring the pan. Cook over medium heat until sauce thickens. Add sesame oil and mix well. To make the fried chicken, whisk together the all-purpose flour and the rest of the cornstarch and add them into the bowl of prepared chicken. Combine well. Heat about 2 inches of frying oil at 375 degrees Fahrenheit and fry the chicken in batches. Fry for about 3 minutes and remove from oil. Place chicken on drying rack for about 5 minutes. Fry the chicken another time for another 2 minutes or until golden brown and crispy. Remove from oil and drain off excess oil.